Bernard is a bear that wants the perfect place to sleep all winter long. The only trouble is that his cave is a bit crowded with Mama bear and the other bear cubs. So off Bernard goes in search of the perfect place to sleep. His first stop is the lily pond where frog sleeps. But Bernard discovers that a pond is not quite the right place for a bear to hibernate. On and on Bernard goes looking at different animal sleeping places (with very patient animals who let the big bear try their small nests, burrows, or badger setts). Finally a smart little mouse shows Bernard where just the right place for a bear to hibernate. 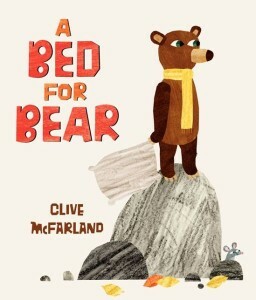 This is a cute story with some fun animals that are not too scary for the needing-a-bedtime-story set. And the little ones will enjoy the page that shows just where Bernard is going (as they discover that it is the same path that Bernard went). Bernard will quickly become a bedtime favorite. March 9, 2015 in animals, bed time, book review, picture books, preschool.